Pope Francis encouraged the work of the Santa Marta Group on February 9, 2018, in an address to its members in the Clementine Hall of the Vatican Apostolic Palace. The group, established by the Holy Father in 2014, was concluding its February 8-9 meeting in the Vatican. 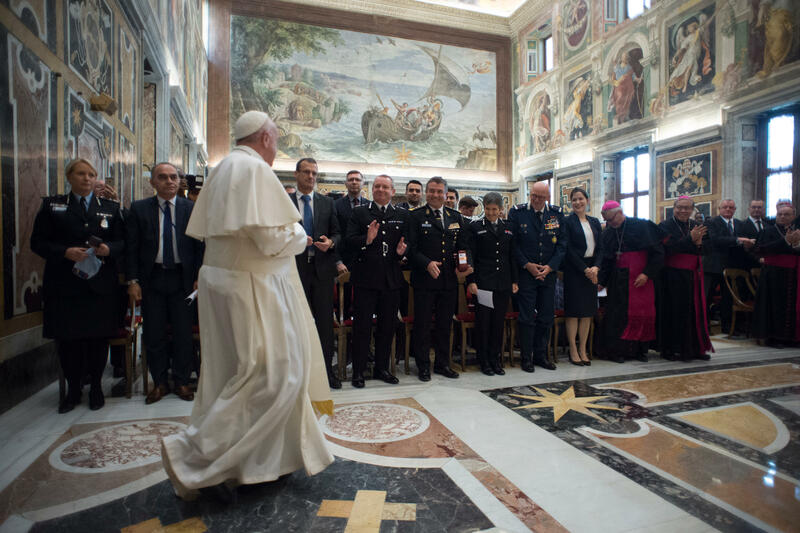 The Santa Marta Group is an alliance of international police chiefs and bishops from around the world working together with civil society in a process endorsed by Pope Francis, to eradicate human trafficking and modern-day slavery. This week’s gathering was the fifth for the group. This year’s conference focused on regional realities with tailored solutions to human trafficking in each continent. With input from every continent, each region discussed their experiences, both the successes and challenges they face, with growing collaboration identified as a priority in neighboring countries where the challenges are similar. Education and economic opportunity is the focus on the supply side from countries of origin and the need for a strong legal framework, accountability and active citizenship on the demand side in countries of destination. While there are significant similarities in approaches to combating human trafficking across regions, the need for local action was emphasized, recognizing the significant levels of internal trafficking taking place. The conference also featured contributions from international agencies, introducing the role of the private sector and the importance of transparency in supply chains. Practical ways to address difficult to track human trafficking, such as slavery within seafaring, were also discussed. A challenge to the group was to increase their accountability through greater transparency with the media, both on work done and long-term strategy. An example was shared from the UK, where Church and Law Enforcement partnered with a media outlet (the Evening Standard) to raise awareness of human trafficking, investigate cases of modern slavery and propose solutions through a roundtable chaired by Cardinal Vincent Nichols.